Paulo Coelho’s enchanting novel has inspired a devoted following around the world. This story, dazzling in its simplicity and wisdom, is about an Andalusian shepherd boy named Santiago who travels from his homeland in Spain to the Egyptian desert in search of treasure buried in the Pyramids. Along the way he meets a Gypsy woman, a man who calls himself king, and an Alchemist, all of whom point Santiago in the direction of his quest. No one knows what the treasure is, or if Santiago will be able to surmount the obstacles along the way But what starts out as a journey to find worldly goods turns into a meditation on the treasures found within. Lush, evocative, and deeply humane, the story of Santiago is art eternal testament to the transforming power of our dreams and the importance of listening to our hearts. 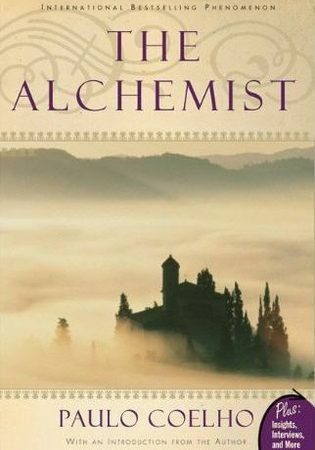 I have heard great things about “The Alchemist” over the years and how the book was such a transformative work for their lives. It was actually one of the first audiobooks I wanted to listen to when I signed up for audible.com. Life happened and I put the book off for many years. Here we are #SummerAudibleBookClub creates the perfect opportunity to check it out. Since it’s been years since I’ve actually known about the book and I’ve since seen interviews and read different reviews it is important that I point out that my perspective going in is much more educated than that of someone knowing nothing about the book beyond the synopsis. I didn’t receive this book as simply a story of Santiago searching for treasure but as a book that can give us all inspiration to follow dreams no matter what. One could simply take the text on face value as a fable with our protagonist being guided by various characters including the Alchemist but there is much more going on here. My biggest take away from this (as it is reiterated in the book quite often) is the quote “When you want something, all the universe conspires in helping you to achieve it.” Doing a little reflection on my own life in terms of what I’ve wanted in the past and what I thought I had wanted there’s definitely a discrepancy between the things that were wants that aligned with needs and frivolous wants that weren’t necessary and also didn’t make sense. Remember that time I wanted to go to law school? Another big take away from this book is the spirituality. I definitely get a sense of needing to step out on faith the way that our journeys may not have the best lit pathways but we will always end up where we need to be. That being said, it isn’t easy, not even in the slightest bit. We’ll all open new chapters in our lives without any proof that the seeds we’ve sown will reap any fruit but that shouldn’t stop us from continuing on and following our dream, whatever it may be. In many cases it isn’t the destination or the treasure, it’s the journey itself that’s more valuable when everything is said and done. The Personal Legend is the path chosen that fills us with enthusiasm, in other words, the path of our dreams. So the quote “Love never keeps a man from pursuing his Personal Legend. If he abandons that pursuit, it’s because it wasn’t true love” means a couple things to me. It means that your destiny will take care of you in terms of passion and romance intersecting as long as you’re following the right course of action. If this isn’t happening, possibly you have deviated from your Personal Legend and need to get back on track. That fleeting-love will probably become a lesson, or at least a whisper, stirring you back towards where you need to be. Alternatively, I see this as a reminder not to let anyone change you. I know, how did I render that from this quote? Well, I figure if no one has the right to request the very thing that makes you be you be stifled for the sake of that relationship. Relationship can be romantic or simply an acquaintance. You are the only you we’ve got, DO THAT, BE YOU! Now without getting any deeper on the subject (because I could go on and on!) I’d love to hear your thoughts! What were your favorite parts? What is your biggest take away? Did you miss “The Alchemist”? Click here to check it out!